Your average chain pub – you know the ones – would be your Katie Price, Kerry Katona’s and Frankie Coccozza’s of this world (remember him? No? Proves my point). Falling over themselves in the race to the bottom. Lacking in individualism and instantly forgettable. Some of the bigger London brewery pubs would perhaps be best represented by Chris Evans or Ant ‘n’ Dec – never going to set pulses racing, but generally popular and a safe pair of hands. Might not tune in, but probably wouldn’t change channel. The welcoming chalkboard outside sums the pub up – “Cask Beer. Other Beer. Other Booze,”. The simple shrug. Other than the chalkboard, you have to get really close to tell if this pub is open. No signs advertising sport or food. No awnings or patio heaters. No drinks offers advertised. It would be an overstatement to say this pub purposefully avoids the trappings of many of its 21st century counterparts; it actually seems to be avoiding the vast majority of 19th century trappings. There is a bar that serves beer and snacks. There are places to sit inside and out. It is dry and warm inside, partly due to what I imagine would be a roaring fire in the darker months. And that’s what makes this a proper pub. The old adage is that it is quality not quantity. Much like the numerous Sam Smith’s pubs reviewed, this pub has a small, independent brewery. 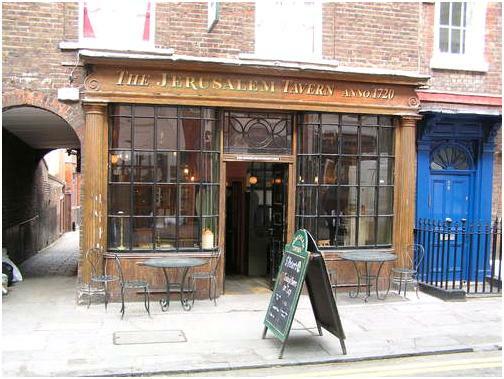 This is the only St’Peter’s pub in London (the brewery website refers to it simply as ‘The London Pub’). The beer is excellent, with a good range of rare, tasty droplets that you could merrily while your way through one afternoon if so inclined. The snacks on offer are hearty and proper – Scotch Quails Egss (I blame you Heston! ), pork pies, hunks of salami and an assortment of potato-based fare. The interior is simple and earthy. Stone floors, long rickety oak tables and sturdy wooden benches. Alcoves and nooks for quiet conversation, a parapet-style seating area offering a perfect spot for people watching. Beers are poured from casks fixed into the wall behind the bar and you get the impression that the building would rather cave in on itself than allow a pink cowboy hat inside.